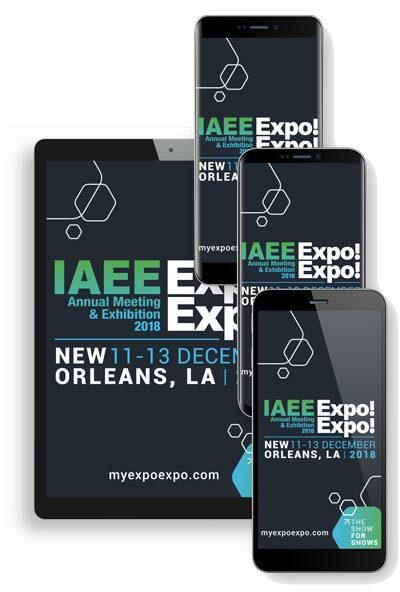 DALLAS, December 4, 2018 — The International Association of Exhibitions and Events™ (IAEE) and its event app supplier Core-apps, announced today the launch of this year’s Expo! Expo! 2018 event app. The app offers new features and functionality, along with a new look, that are designed to make the most of the attendee experience. This year’s event app features cutting-edge tools including an enhanced video library, live audience polling, an interactive featured products section and gorgeous updated visuals. New this year, Core-apps will feature an exclusive augmented reality (AR) experience in its booth, that will be accessible through a secret code in the event app. Only event app users will have access to the AR experience that will include three unique expo specific AR use cases sure to impress show organizers interested in using AR for future events. The AR experience will also be available in the Tech Bar, outside of show hours. Stop by to experience the future of AR for events. IAEE’s Expo! Expo! event app is available for attendees to download now through the Apple App Store and Google Play. Search for keyword “IAEE Events” or click here. Complete details about Expo! Expo! IAEE’s Annual Meeting & Exhibition 2018 can be found here.